The carnage in Iraq is escalating, even as the Islamist-led rebellion in Syria seems unending. What happens when you invade one stable nation, destroy its government and virtually its entire political and social infrastructure, and then a decade later stoke the fire of revolution in a stable nation next door without regard for the consequences? Well, take a look: that’s what the United States has done in Iraq and Syria. Let’s start this commentary by reviewing an editorial in today’s New York Times on Iraq, which warns that Al Qaeda in Iraq (AQI), also known as the Islamic State of Iraq and the Levant—having aggregated the most virulent part of the Syria revolt—is once again gaining momentum. Its stunning jailbreaks that freed up to 800 prisoners from the infamous Abu Ghraib prison and another in Taji have thrown fuel on the fire of renewed civil war in that country. As the Times notes, at least 700 Iraqis have been killed in July, adding to the thousands who’ve died there since April, when violence exploded again. Iraq might have been better able to repel Al Qaeda if Mr. Maliki and the Americans had worked harder on a deal to keep a token number of troops in the country to continue helping with training and intelligence-gathering. Regional volatility, including the Syrian war and Iran, are compounding Iraq’s instability. That underestimates one problem and absurdly overstates another. The “volatility” in Syria—probably the first time that a civil war that has left tens of thousands dead has been described as “volatility”—is a major cause of the Sunni-led revolt in Iraq, and the longer it continues the more likely it is that Islamists in both countries will work together to recruit fighters, purchase arms and exchange bomb-making capabilities. On the other hand, what does the Times mean by volatility in Iran, which is a stable, secure nation without any violence within its borders? It ought to be noted, parenthetically, that when we talk about “Al Qaeda” in Iraq or Syria, it’s hardly the same organization that was responsible for 9/11. In both countries, Al Qaeda is primarily a threat to Iraqis and Syrians, not to the United States. They’re far too busy killing supporters of President Assad in Damascus and Prime Minister Maliki in Baghdad to worry about attacking the United States. Indeed, perversely, if anything Al Qaeda in Iraq and Syria is an ally of Washington. The bombings—18 in all—are part of a wave of bloodshed that has swept across the country since April, killing more than 3,000 people and worsening the already strained ties between Iraq’s Sunni minority and the Shiite-led government. The scale and pace of the violence, unseen since the darkest days of the country’s insurgency, have fanned fears of a return to the widespread sectarian bloodletting that pushed Iraq to the brink of civil war after the 2003 U.S.-led invasion. On the tenth anniversary of the April 2003 fall of Saddam Hussein’s secular, nationalist government, Paul Wolfowitz—a neoconservative and key architect of the American invasion of Iraq—wrote a lengthy apologia for the war. In it, he concluded: “It is remarkable that Iraq has done as well as it has thus far.” Besides Wolfowitz, various other members of the George W. Bush administration have similarly weighed in, insisting that the unprovoked, illegal war against Iraq was the right thing to do. Since that April anniversary, thousands of Iraqis have been slaughtered in sectarian and political violence. In May, more than 1,000 Iraqis were killed in a relentless wave of bombings, suicide attacks, assassinations and other violence, according to the United Nations, and nearly 2,000 have been killed since April. No doubt, those totals understate the true scope of the killing. Since then of course, the list of horrific killings in Iraq has expanded. In a sign of how utterly confused American policy in the Middle East is, the United States is using intelligence units and Special Forces to help Iraq’s Prime Minister Nouri al-Maliki track down the escaped prisoners. At the same time, however, the United States is fanning the flames of the revolt in Syria, which is led by the allies of the very people the United States is trying to combat in Iraq. To make matters worse, the United States is in conflict with Iran, which supports the governments in Iraq and Syria. And still, the United States refuses to go along with Russia’s reasonable request that the United States agree to invite Iran to take part in the proposed conference on peace in Syria to be held, if ever, in Geneva. On May 28, Russian Foreign Minister Sergei Lavrov emphasized the necessity of Iran’s attendance at the upcoming talks in Geneva. “The issue of Iran is key for us. Iran, without question, is one of the most important nations,” he said. President Obama must be wondering what happened to the vaunted “pivot” to Asia. With Israel-Palestine talks at center stages, Egypt in full crisis, Syria in civil war, Iraq exploding, and new P5+1 talks with Iran on the horizon, the White House must be spending nearly all of its foreign policy time on the Middle East. Obama must do it all at once: wind down the war in Syria by seeking an immediate ceasefire, restart talks with Iran to include regional issues (including Syria), keep the pressure on Israel’s Prime Minister Netanyahu to make a deal on Palestine, and prevent Egypt’s crisis from deteriorating. 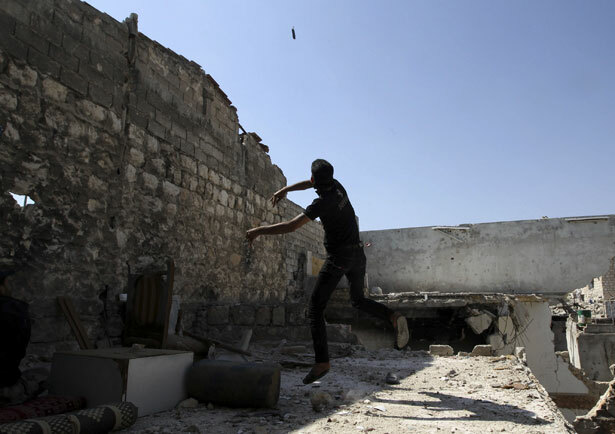 What history tells us about US plans to arm the Syrian opposition.